Boy did I hate Brussels sprouts when I was a kid. To my six-year-old self, these were an odd-looking vegetable not meant for human consumption. Kudos to my parent, the Brussels sprouts kept returning and eventually, I learned to like them. Now, older and wiser, I absolutely love them. Their baby cabbage like appearance, their strong almost spicy bitter flavor, all of it. I often slice them in half and roast them with some olive oil and sea salt, but I also love to shred them. 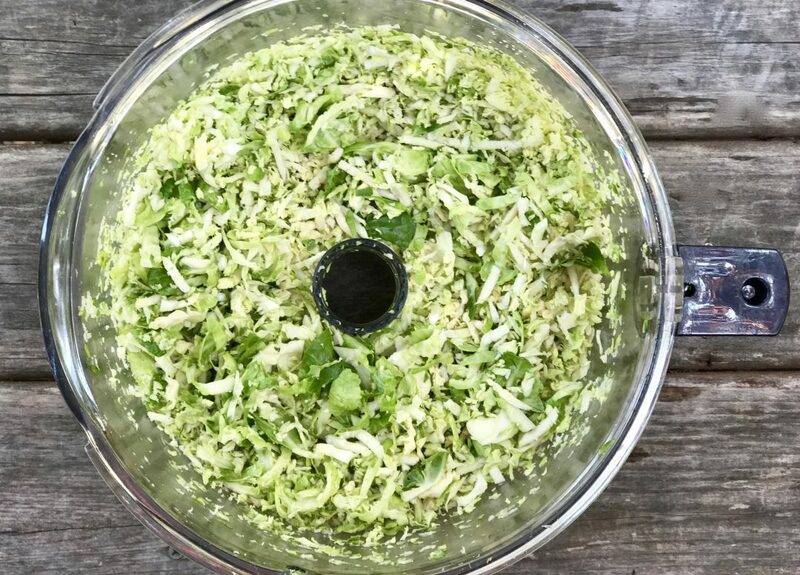 Not only does this reduce the cook time down to minutes, it also makes them slaw-like and a great Fall/Winter side dish. Brussels sprouts are in the cruciferous category of vegetables, which also includes cabbage and broccoli. Health-wise, these little guys are low in calories and fat, they are high dietary fiber and contain 20 essential vitamins and minerals, making them a preferred vegetable for me. Brussels sprouts are native to the Mediterranean region but were later cultivated more readily near Brussels, from which they derived their name. 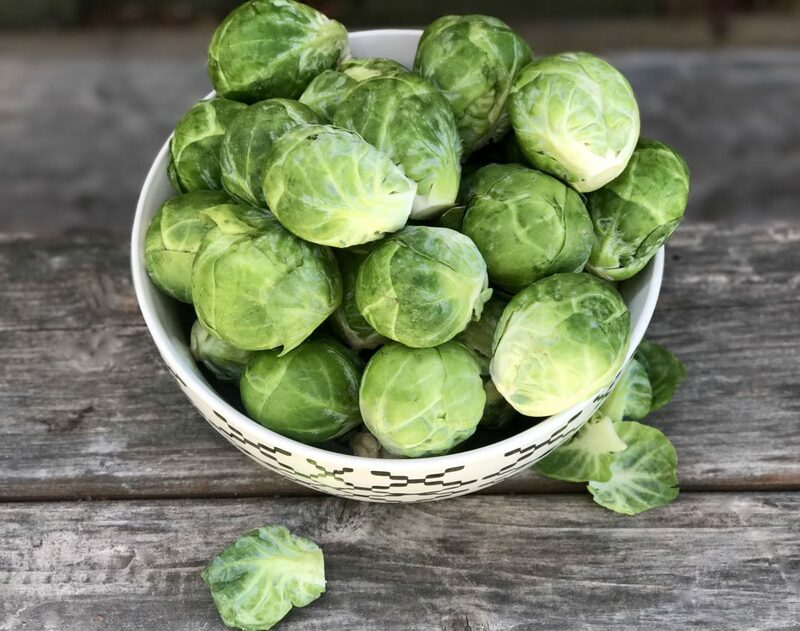 Commonly misspelled and pronounced, the correct name is “Brussels sprout” but are often referred to as “Brussels sprouts“, “Brussel sprouts”, or “Brussel sprouts“. 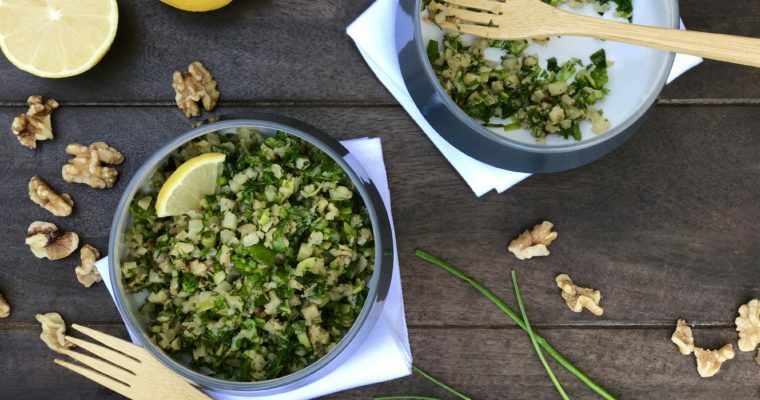 These days you can even buy pre-shredded Brussels sprouts, making this easy recipe even easier. Stores like Whole Foods, Trader Joe’s and Safeway all carry this convenient option, which I encourage you use to save time if needed (though I think you lose a bit of flavor if you go this route). The best option is to find fresh sprouts from your local farmers market, and to shred them right before making. Crispy salty bacon, cranberries and pecans mixed with a touch a sweetness, blend together nicely making this a hearty side dish that you can enjoy hot or at room temperature. 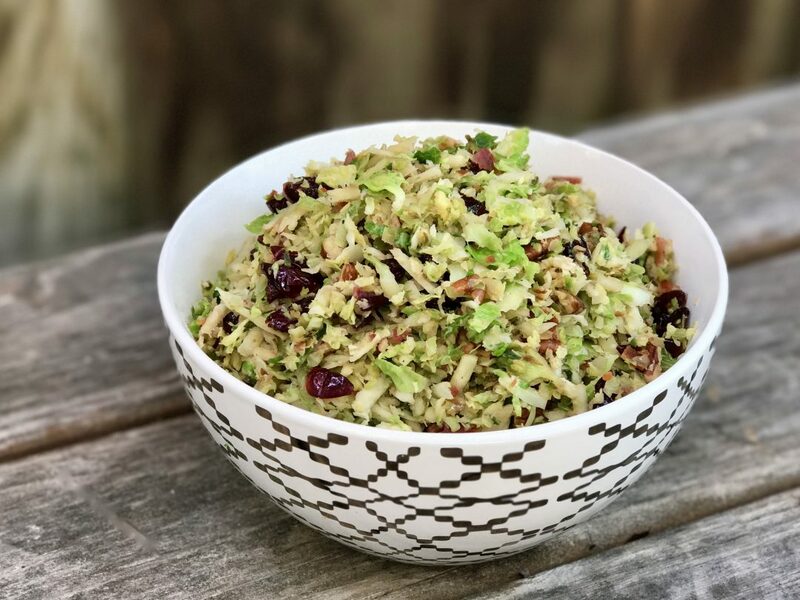 This shredded Brussels sprout recipe makes a great side dish at any meal and is perfect for holiday time, as it highlights many wonderful autumn and winter ingredients. Step 1 In a medium sauté pan cook the bacon, turning once, till golden in color and crispy, about 5 minutes. Reserve the bacon fat for later. When cool, crumble the cooked bacon and set aside. Step 2 Using a kitchen mixer such as a Cusinart fitted with a shredding blade, shred the Brussels sprouts. Discard any large pieces that did not shred entirely. Step 3 Place a large sauté pan over medium-high heat. Add the olive oil and the reserved bacon fat. 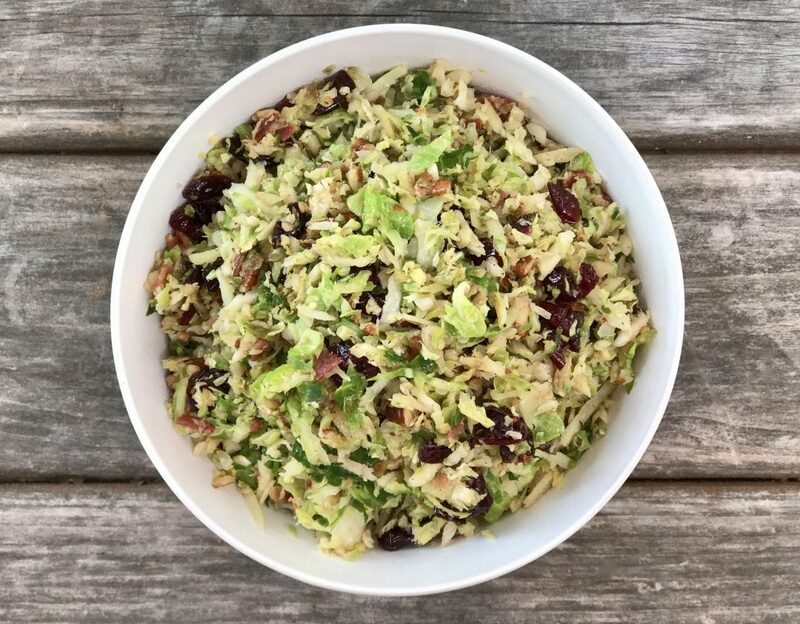 When hot, but not smoking, add the shredded Brussels sprouts, salt and some black pepper and sauté stirring occasionally for about 4-5 minutes. Add the brown sugar, stir to coat and cook an additional 30 seconds. Step 4 Stir in the crumbled bacon, cranberries and pecans. Adjust the seasoning to taste and serve hot or room temperature. 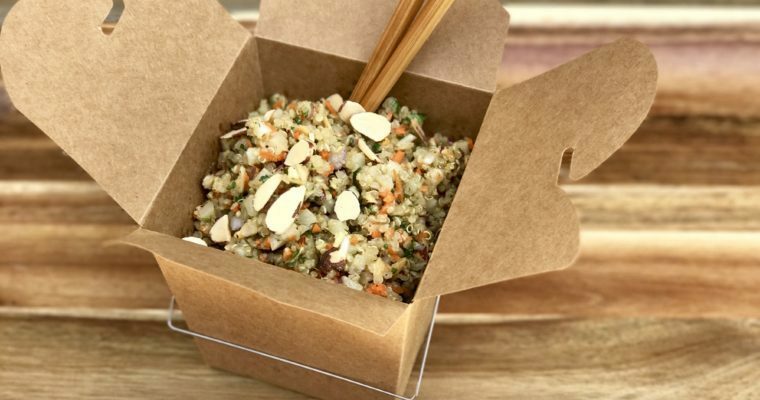 Teriyaki King Salmon With Tri-Color Quinoa, Boy Is This Tasty!